Under the influence of the era’s finest choreographer Marius Petipa, late 19th century ballet became ever more lavish and sophisticated. Typified by glamorous and frequently over-the-top productions, it has been appropriately characterised by Zoë Anderson as “polished to crystalline brilliance” (The Ballet Lover’s Companion [New Haven, 2015], p. 39). The 1890s in particular – bookended at one end by Tchaikovsky’s The Sleeping Beauty (1890) and at the other by Glazunov’s Raymonda (1898) and The Seasons (1900) – has a substantial claim to be considered the golden decade of a style of classical ballet which retains its popularity among audiences worldwide to this day. Given ballet’s high artistic profile and commercial viability at the time, it is perhaps surprising that Johann Strauss II did not venture fully into the field until he was approaching his mid-70s. Europe’s undisputed ‘waltz king’ had, after all, spent the previous half-century producing almost 500 waltzes, polkas, quadrilles and other dances with apparent ease. Moreover, the specific requirements and complications of writing for the stage clearly held no apprehensions for him, as demonstrated by his stream of successful operettas. Although Strauss’s Cinderella remained incomplete at his death in 1899, it was far enough advanced to justify its completion by the experienced ballet composer Josef Bayer. In spite of Beyer’s skilled work, however, the ballet seemed initially ill-starred. Quite apart from the fact that Strauss himself – an accomplished self-publicist – was no longer around to promote it in person, Gustav Mahler reneged on a promise to have it performed at the Court Opera, an attempt to mount an alternative Viennese performance proved abortive, and the work was eventually only staged in Berlin on condition that the libretto was considerably revised – which in turn necessitated a radical reordering of the score. While the Berlin premiere was an undoubted success, Cinderella failed to establish itself thereafter as a permanent feature in world ballet’s standard repertoire. In speculating why that might have been, one or two possible explanations suggest themselves. In the first place, Strauss had decided to differentiate his own version of the familiar tale from those of other composers by exploiting a Viennese fin de siècle fad for productions with contemporary settings. He therefore conceived Cinderella as a ‘realistic’ version of the story set in the urban hurly-burly of a contemporary dressmaker’s workshop and a department store. It is, though, not just a modernised fable but also a slyly comic take on the Viennese bourgeoisie, thereby echoing Die Fledermaus in which Strauss had similarly depicted the frivolous and rather stupid Eisensteins being outwitted by their far more streetwise servants (review) for the operetta’s later balletic treatment). Its modern-day setting and social ‘message’ – and the accompanying deliberate eschewal of the escapism offered by Tchaikovskian courtly glitter and glamour – may have been factors that dated Cinderella quite quickly. Interestingly enough, recognition that the original scenario might indeed have needed an injection of extra flamboyance came in 1999 when the Ballett der Wiener Staatsoper’s centenary revival abandoned the 1890s workaday world of commerce setting altogether. Instead the company presented the story as a late 20th century comic fantasy, its glamour supplied by some colourfully over-the-top and often eye-boggling costumes designed by the leading Paris couturier Christian Lacroix. Strauss’s score itself may also have mitigated against Cinderella’s long-term success for, while it undeniably has many quite charming individual moments, it is over-reliant on a handful of memorable themes, rendering it rather repetitive and ultimately somewhat dull. It frequently sounds like a somewhat patchy sequence of Strauss dances rather than an integrated whole. There is, of course, not necessarily anything intrinsically wrong with that – it is, indeed, the way that ballet composers had typically worked before Tchaikovsky had revolutionised matters by writing his grander, more integrated and “symphonic” scores. But, heard in the wake of The Sleeping Beauty or even The Nutcracker, Cinderella is decidedly deficient in emotional impact or much in the way of dramatic oomph. Charming is sometimes just not enough – and when one reads in the booklet notes that this new recording is part of a project focusing on ‘The unknown Johann Strauss’, the pfennig suddenly drops: perhaps Cinderella falls into that category simply because it deserves to? Strauss’s only ballet has, then, remained something of a curiosity. You will, indeed, fail to find even a peripheral mention of it in such standard English language works as Cyril Beaumont’s Complete Book of Ballets (London, 1937), Robert Greskovic’s Ballet: a Complete Guide (London, 2000), Jennifer Homans’s Apollo’s Angels: a History of Ballet (London, 2010) and Zoë Anderson op. cit. There is, it’s true, a filmed performance of the aforementioned 1999 Ballett der Wiener Staatsoper production that was much enjoyed more than a decade ago by my colleague Raymond Walker (review), but none of the MusicWeb team ever seems to have considered the 1980 recording of the score by Richard Bonynge and the National Philharmonic Orchestra (my own copy is on Decca Ovation 430 852-2, a release that also threw in the ballet music from the composer’s comic opera Ritter Pásmán and some excerpts from Leonide Massine’s ballet Le beau Danube). Bonynge provides, then, the only obvious comparison with this new CPO release – but even that turns out to be a rather indirect one. As already mentioned, in order to secure Cinderella’s 1901 premiere in Berlin, Josef Bayer had been forced to reorder the score drastically so as to make it fit a newly mandated storyline. According to Michael Rot’s informative CPO booklet essay, in practice that meant dividing Strauss’s original into no less than 95 short sections that were then manipulated like the fragments inside a kaleidoscope to create an entirely new musical sequence. It was only a century later in 2001 that, after some intense detective work in the archives, Herr Rot himself managed to reconstruct the original pre-Berlin Strauss/Bayer score. Thus, while Bonynge gives us the music as reordered for the premiere performance and performed thereafter, this new CD release allows us to hear, for the first time, the music in the sequence that Strauss and Beyer had originally conceived. While we ought rightly to be grateful for Michael Rot’s scholarly efforts, anyone who already possesses Bonynge’s recording can probably rest happy. Performed by the National Philharmonic Orchestra, London’s finest pick-up band of the time, captured in refulgent Decca sound though in an atypically resonant Kingsway Hall, it remains a more than acceptable library choice. 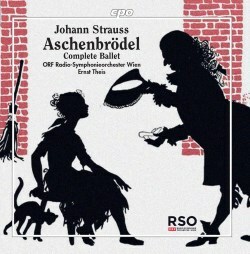 Ernest Theis’s new version is, though, the one I’d choose if coming to Strauss’s Cinderella on CD for the first time. His often somewhat brisker tempi propel the music forward in a more interesting and engaging manner and a less reverberant recording acoustic ensures that orchestral textures remain clear throughout. The Austrian Radio Symphony Orchestra must, one imagines, have Strauss’s rhythms embedded in its collective DNA: its members certainly display a completely convincing feel for the composer’s musical idiom. Ultimately, though, there is, I think, an even better account of Cinderella to be found – not on CD but on the DVD of the 1999 Vienna performance already mentioned. On that occasion conductor Michael Halász gave a far more convincing and involving account than either Bonynge or Theis. Mr Halász is obviously a skilled conductor – his dozens of recordings on the Naxos label will be familiar to most MusicWeb readers – but so are his Australian and Austrian competitors. Why then is it that I found his account of Cinderella to be the most enjoyable of the three? A number of possible answers present themselves. In the first place, making a recording live in a theatre with an audience may simply add a previously-missing sense of occasion – or, indeed, that magical oomph – to a performance. Maybe, too, the fact of having to match the conducting to the choreographer’s vision and to the subtle practical requirements of dancers on stage necessitates extra flexibility from the conductor and a preparedness to move imaginatively away from the composer’s rigid tempo markings when required. Perhaps, though, a simpler explanation presents itself: that a score’s manifest weaknesses can be somewhat disguised – or perhaps even overcome – when we listeners are distracted by the visual excitement of, in this case, an eccentrically colourful staged production. In order to verify that third hypothesis, I ought really to have listened to the DVD’s soundtrack without the accompanying film. I confess, though, that I haven’t done that, simply because, in this case, those visual images are so attractive that I don’t think that I actually want to hear the music again without them. My overall verdict is, then, that if you are someone who really can’t stand watching a ballet performance – and people like that really do exist! – go for this new Theis CD or, if you already own it, stick with Bonynge. Ideally, however, you should track down a copy of the Vienna DVD for the full Cinderella experience – supplementing it with this new CPO release, perhaps, so as to hear the music as Strauss/Bayer originally intended and in the best possible digital sound.